for $350,000 with 3 bedrooms and 3 full baths, 1 half bath. 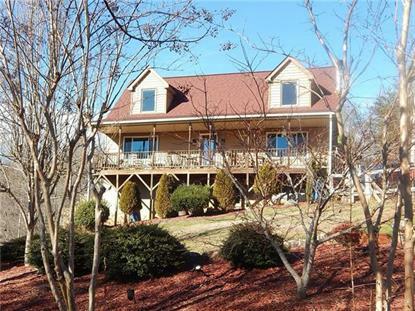 This 2,990 square foot home was built in 2000 on a lot size of 5.320 Acre(s). Mountain views from this meticulously maintained 3BR/3.5BA home on over 5 acres within minutes to I-40 & Downtown Morganton. Plenty of room for recreational vehicles, multiple outbuildings w/electric for workshop or amped for camper parking. New 2018 Roof, Newly replaced Heat pumps. Covered front & back decks allow you to sit and enjoy yearly mtn views, landscaped yard, garden area & partially fenced yard. Creek runs from upper property bordering back property line. An abundance of natural light throughout the home. Main level opens to living room, fireplace w/ gas logs, spacious kitchen w/ all appliances, dining area, laundy, half bath along with Master Ensuite w/ Full Bathroom, garden tub, separate shower & WIC. Upper level with 2 gracious bedrooms, ample closets, full bathroom and open office/ reading area. Finished basement with Int & Ext entrance could be separate living area for ext family. Bonus room as 4th bedroom, Full bath, family room, Rec Room and Kitchenette area.